On the field, Byron Buxton’s emergence might be the most important key to the Twins winning next season. 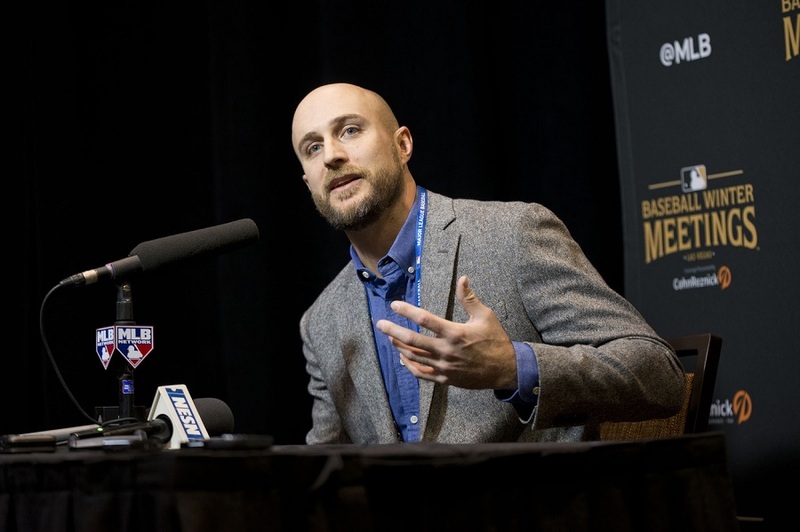 While Buxton is key on the field, new manager Rocco Baldelli has a lot to prove to the front office and to Twins Territory. Right now, he is saying all of the right things but winning and losing go a long way to prove, or not, a manager’s worth. Can Rocco bring the Twins into the modern managerial world? It could be crucial if the Twins want to win back the AL Central. Twins owner Jim Pohlad said Paul Molitor would continue to manage the club when Derek Falvey and Thad Levine took over the Twins front office. Molitor would win the AL Manager of the Year Award in 2017 as the Twins surprisingly qualified for the final Wild Card spot. It was hard to dump him at that point so Falvey and Levine stuck with him for one more season. Even with the Twins finishing second in the AL Central, the writing on the wall was clear: The new front office wanted a more forward-thinking manager to steer the Twins back into contention. Molitor was removed from his managerial duties and the Twins went on the hunt for a modern manager. Baldelli’s once promising playing career was cut short by illness and injuries. He joined the Tampa Bay Rays as an assistant and then was a coach in the years since he was forced to retire. Last season, he was given the title of major league field coordinator. This allowed him to work with the manager on in-game strategy while continuing to work to develop the team’s younger players. Now the 37-year old is tasked with turning around a core of young Twins players that need their own development. Players like Byron Buxton and Miguel Sano underachieved throughout 2018. So far this off-season, Baldelli has visited both of these players at their homes. Just one of the first signs of his abilities to connect with players. Baldelli should also bring some new ideas to the Twins managerial position. Tampa Bay has long been considered a hotbed for forward-thinking coaches. Baldelli played almost his entire career in the Tampa Bay organization and even played under Joe Maddon, who is considered one of the game’s best managers. One of the new things Baldelli could bring to the Twins is a comfort with a concept like the opener. This was originated with the Rays last season and Minnesota has some in-house options that could slide nicely into an opener role. Minnesota started using openers throughout their system last season but Baldelli might make this a regular occurrence for big league pitchers. He’s also mentioned that he wants players to be more mentally prepared for the game. Baldelli even mentioned that the players might not always be ready physically, but he needs them to have their heads in the right place for this team to find success. As a player, he fought through plenty of injuries, so this seems a likely focal point for the new manager. Baldelli will need to establish his culture in spring training and the early months of the season. He’s been saying all the right things but winning isn’t going to happen overnight. Minnesota’s window of opportunity is just starting to open and the club needs Baldelli to take them to the next level. What can Baldelli do for the club in 2019? Leave a COMMENT and start the discussion. This is the most exciting addition of the off season. Hopefully he paid attention when Joe Maddon was his manager. What can he do? How about not have three of his relief pitchers on the appearances leaderboard at the all star break. That’d be a good start. Pitch the same relievers repeatedly until exhaustion. Work on the mental side of the game with the younger players.Cut down on the silly mental errors some members of this ballclub seem to do. Make sure there are defined standards that your players are expected to follow, and make sure that there are consequences (like a couple of days on the bench) if you do not.You don't want the players to be safe and non aggressive, but at some point they have to ceasebeing stupid. His biggest challenge will be motivating the young Twins core. I think it will help that he was supposed to be a star but then injuries curtailed his career, he can point to himself and tell the players that your career is short, work hard and make the most of it!!! My biggest concern is his total lack of managerial experience. We went thru that with Molitor, the learning on the job. You can watch video and recall your own experiences forever but until he has to make the decision(s) that will win or lose the game.....Having 300-400 games of minor league managing would help with that. The Key to 2019 is Falvey and Lavine and Baldelli... They are all one now. They got their own guy. Front offices, Managers and lineup cards are so intertwined these days. They can no longer be easily separated. Falvey and Lavine now have a hand picked guy in Baldelli. The three of them will have my full support until they fail to adjust to failed play like they did in 2018. I also have no choice but to renew my opposition to any expressed sentiment that Byron Buxton is the key (might be or any degree) to anything. Buying into that narrative just absolves the front office from any responsibility. Much like the excuse last year... "We didn't get the performance we projected from Sano, Buxton or Dozier". Buying (even slightly) into the narrative that it all rests in the shaky hands of a young outfielder just lets them use the same excuse again in 2019. The front office (which Baldelli is now part of since they are intertwined) is the key to 2019. It's the people who hire the people. Don't buy it, because they had an entire season and off-season to address it. Welcome to Minnesota... Rocco Baldelli. The mental approach angle is music to my ears. No excuse for a highly paid pro athlete to not have his head completely in the game. Baseball is not complicated but has been made complicated by all of the metrics, shifts, attempted match ups for every possible situation. I hope his mental approach involves keeping it simple and not beating yourself. Most games are lost, not won. I'm excited for Baldelli. I'm not excited that people keep implying that Buxton and/or Sano are the keys to success. There are lots of ways to win baseball games, I don't like the idea that we're pinning everything on one unproven young player. Just build the best team you can and if he contributes great, if he doesn't, deal with it and MOVE ON, he's just one out of 24 players on the roster. Hhe can point to himself and tell the players that your career is short, work hard and make the most of it!!! That ought to play well, when the front office then tries to negotiate a team-friendly contract extension that delays free agency by only a year or two. I doubt if Baldelli is the key to much of anything. Since managers aren't allowed to make out lineups and analytics decide in game decisions, the role of the manager is conduit and cheerleader. While this is an overstatement, Brian is right about the intertwinement of FO and on field roles. What will be important is whether the young core steps up. If Schoop, Cron and Cruz are batting 1,2,3, in June, the Twins are in trouble. If Sano and Buxton can't stay healthy and produce, then I want to see somebody from the upper minors getting their chance. No Cave or Andrilanza getting 400 abs. The same thing on the pitching side. Since the FO was unwilling to go after a Kuechel or trade for a Gray, they must believe that they have quality reinforcements among the group that figures to start at AAA or AA. The FO needs to be right about that. The Twins really should be contenders this year. Cleveland wasn't great last year, and on paper, they have gotten worse. It is going to a surprise if any of the other 3 can make a run. I don't think Baldelli should need to motivate anybody or help anybody focus. If these young players can't see where they are in their careers and the need to prepare themselves to play everyday, we have the wrong players. I understand your frustration with everybody saying that the Twins season depends upon Sano and Buxton but the reality is that they are the two players with the most potential to help the Twins move into contention.And since they do each have that enormous potential, they Twins have to play them both the majority of the season.Find out if they are the players everybody hopes they are.And pray for no more wallbanging by Buxton and other dingers for Sano. Trust me, I'm not a fan of either one of them, Buxton with his reckless injury inducing play and Sano with -- not even going to go there....Just cross your fingers that they can finally live up to all the hype. I believethere are lots of good managers, acceptable managers, but few great ones.I believe in a full coaching staff of quality people to prop up the manager.I also believe that the FO needs to provide better players and especially better BP options than they gave Molitor.Good luck Rocco.The real key to a manager is maintaining a positive attitude with the team. 2019 should be another season of extensive experimentation, especially with the pitching staff. AA and AAA are loaded with arms that should get a look at the bigs this season. Like a few others, I'm getting fed up with excuses for Buxton and Sano, and even Kepler is wearing out my patience. These guys better come to spring training ready to stomp other teams with every aspect of their play. Otherwise, younger, hungrier players might start getting playing time. I'm all for getting Rooker and Gordon up for their first cuppa. Can't wait to see Lewis and Killeroff tear it up in ST. Also I wanna see if Gonzo and Stewart have found something new to show us. The Twins can still play Buxton the majority of the season, it doesn't mean he has to be the focal point and the key cog in the machine. Steve Lobardozzi wasn't either of those things and he played near every day batting about where Buxton will to start the year too. You should build up your team with potential, you shouldn't build your team around potential. Build it around known commodities; if you don't have enough of that, you're work isn't done. This team's work isn't done yet. Buxton should be an after-thought at this time and if he comes out of his shell, a wonderful surprise that maybe can be built around at a later date. My hope... my prayer actually... is that Baldelli and the collective brain trust play the players who are playing the best... and that's it. If that is Buxton... fantastic... if it's Michael Reed... OK. I'm not saying that Buxton should be cut or traded at absolute low value, because he has an option left and years of control left. There is time to fix him. But I am saying that in 2019 and beyond the 4th OF position is a role on the team that is EARNED by whoever is playing worse than the other 3. If they offer the same excuse in 2019 that Buxton or Sano didn't perform or stay healthy like they were projected to. I'm going to reply with "Same as last year, lesson was not learned". Charlie Brown should have found a holder that he could trust. Instead he kept believing in Lucy. It isn't Lucy's fault. The Twins need a couple of their young players to turn into stars or they won't win at the level that would satisfy us. What known commodities should the Twins build around? I don't see any on the roster who are anchors for a championship team, and I only see two who are close - Rosario and Berrios. I don't see Rosario ever getting there, and Berrios isn't there yet (but I could see it happening). I see a few guys who would be useful parts on a championship team (Rosario, Gibson, Rogers, Polanco, Cruz, May) and some more who could be if things break right (Reed, Kepler, maybe Castro and Pineda, Schoop, Cron). The most likely candidates to be the stars we need to anchor a team are Buxton and Sano, with Berrios also a possibility.The other guys who could step up are Polanco and maybe Kepler.I'd say we need three legit stars to have a chance. I would love to have the Twins go after Machado or Harper. That would mean only two of the five potential stars would need turn into actual stars.